Yesterday overflowed into this morning. I woke up feeling drained, stressed, tired, and just plain overwhelmed. My boys woke up fighting. I noticed after they left for school that a some what expensive piece of electronics was not where it was supposed to be and I feared one of them had taken it to school. I had a headache and the start of Makenzie's cold. We are leaving for CA in less then 2 weeks. As of last night I had all of the information into Miracle Flights for our airplane tickets and my file had been handed over to the flight department. I still had yet to book a hotel or a car because I wasn't sure if I was going to have to purchase plane tickets. If I did I wanted to book them all together and hopefully be able to save some money with a package deal. To add to that we are leaving for Costa Rica and stem cell therapy in 5 weeks. The travel is booked for that trip and has been for awhile but the actual therapy is still in need of massive funding. If you add up the 2 trips we are in need of about $13,000. Yes, you read that right. A new car, 3 week long trips to Disney World for my family of 5, a full remodel on my kitchen, landscaping for my yard, I will stop there cause I think you get the point! I would love to have all of the above fun and functional things but what I want more is for Makenzie to continue healing. She has made some very huge improvements in the last 9 months since we went to Costa Rica and started ABM! Life has gotten so much better for our whole family because of this healing! So yes STRESSED really doesn't even begin to explain how I felt this morning!!!! We finished therapy and I picked up the phone to call a friend. I needed to talk all of this out. I got Makenzie ready for school. We laid on Makenzie's mat and played for a bit and then the phone rang. The turn around to my day was about 3 minutes away. On the other end was my contact person at Discount Tire Company. I had sent him an e mail explaining our plans for the next 2 months. I got an e mail back asking me some questions so I answered. This phone call..... was to tell me that DCT was going to be able to help us out with the ENTIRE trip to the ABM Center! THANK YOU BRUCE HALLE AND THE ENTIRE DISCOUNT TIRE FAMILY! To say at that moment I felt like a 1,000lb weight had been lifted off my shoulders would be an understatement! I skipped Makenzie to school with a huge smile on my face. I came home and started dinner and folded laundry also grinning from ear to ear. Now who does that!!!! THANK YOU FOR LOVING AND SUPPORTING MAKENZIE IN HER HEALING! THANK YOU FOR EACH AND EVERY PRAYER THAT YOU HAVE LIFTED UP IN MAKENZIE'S NAME!!! 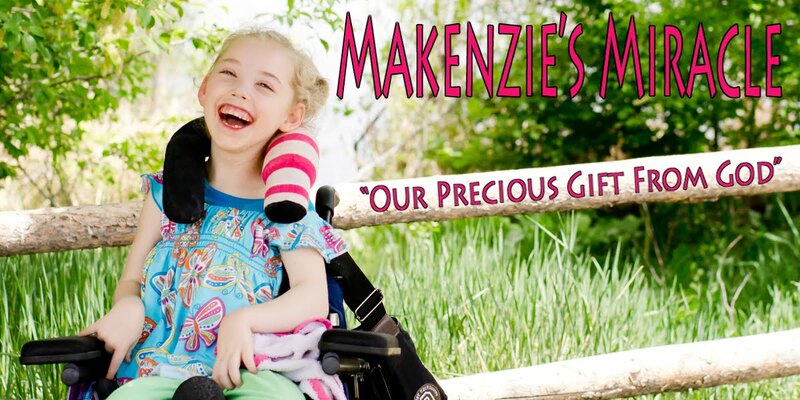 If you are interested in finding how you can help our family get Makenzie to Costa Rica for another amazing stem cell treatment, please click here! Any help large or small will get us one step closer!